Tyler Perry is a genius and has made history in many ways in film, stage plays and television with his infamous Madea character. However, there were others before him who paved the way for African American comedians. In fact, Flip Wilson brought out Geraldine long before other comedians playing women made their mark. NBC debuted The Flip Wilson Show in 1970. Along with performing a variety of comedy sketches, Flip hosted several African American entertainers from the Temptations to Bill Russell to the Jackson Five to Redd Foxx. Geraldine Jones was Flip’s most popular character followed by his materialistic pastor Reverend Leroy. Geraldine creating national catchphrases like “What you see is what you get” and “The devil made me do it.” Though the show ended in 1974, they had eleven Emmy Award nominations, won two and he won the Golden Globe Award for Best Actor in a Television Series during their run. At the age of 64 in 1998, he died in Malibu, California from liver cancer. He left behind five children and a performing arts legacy across TV, movies and musicals. 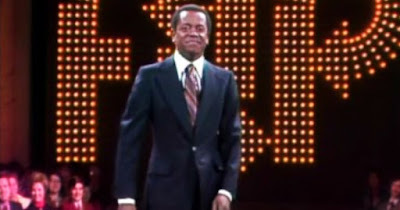 Even more, Flip Wilson left behind a legacy as the first African American with his own show and paved the way for countless comedians after him. The New Jersey Hall of Fame nominated him for his performance arts services in 2015.